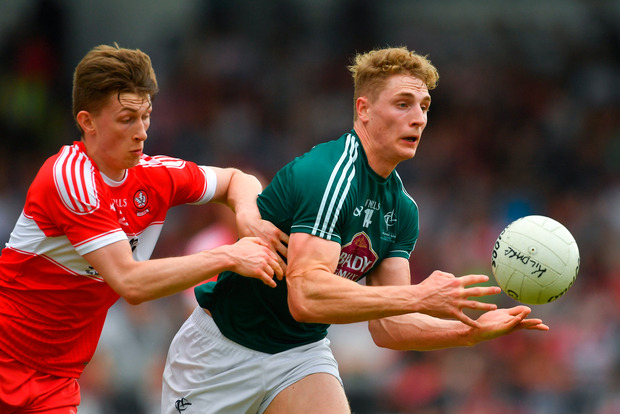 When a player who attempts the audacious shots that are a standard part of Daniel Flynn's repertoire admits that he has been struggling for confidence, it encapsulates the grimness of Kildare's 12-match losing run. Thankfully for Lilywhites supporters, the devastating inside forward was talking in the past tense on Saturday evening as he contrasted the stunned silence in the dressing room after the loss to Carlow with the rays of positivity now penetrating the dark cloud that has hung over Kildare football for a year. It was only a first round qualifier win over Derry, but when you've waited close to 365 days for the right result, you won't sneer at what's offered. Confidence visibly returned to the Kildare players during their 2-22 to 2-14 victory, summed up by Flynn's net-bursting thunderbolt that served as the perfect riposte to Derry's early goal. The forward line, which had been stymied, frustrated and wasteful against Carlow, helped end a yearlong slide as their starting six notched 2-9 from play. The final whistle wasn't quite reminiscent of the ending of other GAA droughts, but the interactions between Kildare players and supporters at the final whistle told you just how much they wanted this one. "After the Carlow game, it was bit like disbelief to be honest," Flynn said. "It felt like the game passed me by whereas now this is great. You would swear we are after winning a competition with the amount of people on the pitch. It's just a nice feeling and it makes it worthwhile. "It's a weight off the shoulders," he added. "It's been a long year. With myself the last couples of weeks, confidence and self-belief just chipping away slowly but surely. It's just a big relief." Winning tends to ease the toxicity in the air, and Cian O'Neill will hope last weekend gets him out of the firing for a little while at least. Flynn has taken the wise course of action of removing himself from the online conversation to avoid the championship flak that flies at this time of year. "I'm a bit sheltered from it, I deleted social media for a couple of months just to get rid of it," he said. "Not because of football, but just to get away from it. Going from what people were saying there was a bit of bad talk and negativity around the county, which is understandable." The 23-year-old showed glimpses of his top form in Owenbeg, and if he can do for 70 minutes what he did for his first half goal, he will tot up an impressive tally against even the best teams. "I got it a bit out and when I got to around 20 yards out thought, 'there could be a goal on here'. I hit it as hard as I could and it went in just under the crossbar. I was bolloxed for about 20 minutes afterwards!"